It's Thursday and I'm loving it. Today I'm introducing an awesome local sunglass company called Ltd. Optics. I know what you're thinking: Sunglasses? In the Winter? Really, Ariel? Well guess what guys, THE SUN COMES OUT IN THE WINTER TOO!!! Mind blown, right?? In fact, I feel like sunglasses are needed even more in the Winter because when the sun is out, it reflects off the pure white snow, blinding your vision! I mean, let's face it, you never see a snowboarder or skier on the slopes without their sunglasses or tinted goggles. I know what you're thinking next: But any good quality sunglasses worth buying are sooooo expensive! Well, that's where Ltd. Optics comes in! Ltd. Optics was inspired because of the growing cost of high quality sunglasses! They bring high quality, low price, and lifestyle oriented sunglasses to the market, proving that you don't have to pay a fortune for a pair of excellent shades. My favorite thing about these sunglasses--besides how stylish they are--is the comfortable fit! I hate it when sunglasses are too big for my head--sometimes they fall right off my face if I glance down for a second. Ltd. Optics takes into account that most people live an active lifestyle and offers sunglasses that have a nice, secure fit. Not to mention they are also eco-friendly! The Woodrow Shades that I'm wearing in these pictures are made from bamboo, making them feel right at home when you wear them on your peaceful hike in the mountains. So what are you waiting for? Snag yourself a pair of Ltd. Optics sunglasses! Or better yet, check back tomorrow for a chance to WIN a pair of sunglasses from Ltd. Optics! This is a giveaway you won't want to miss out on! Adorable as always! 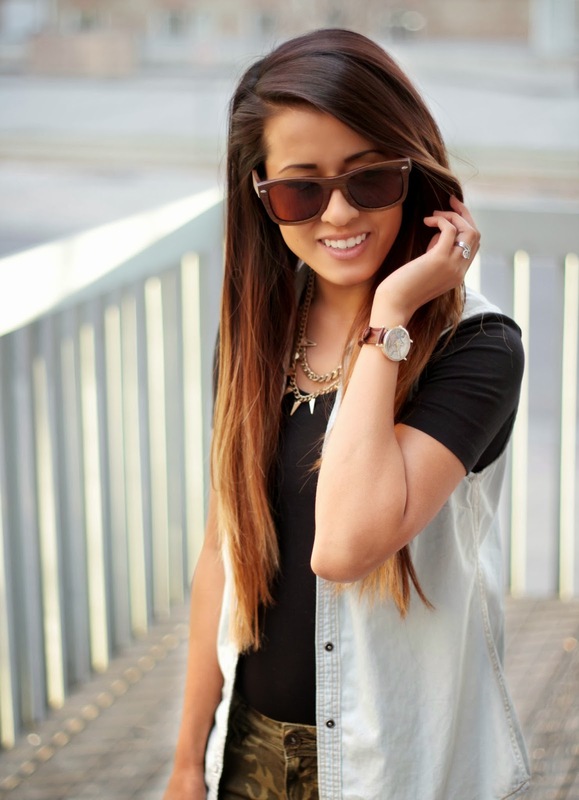 Love the sunnies! 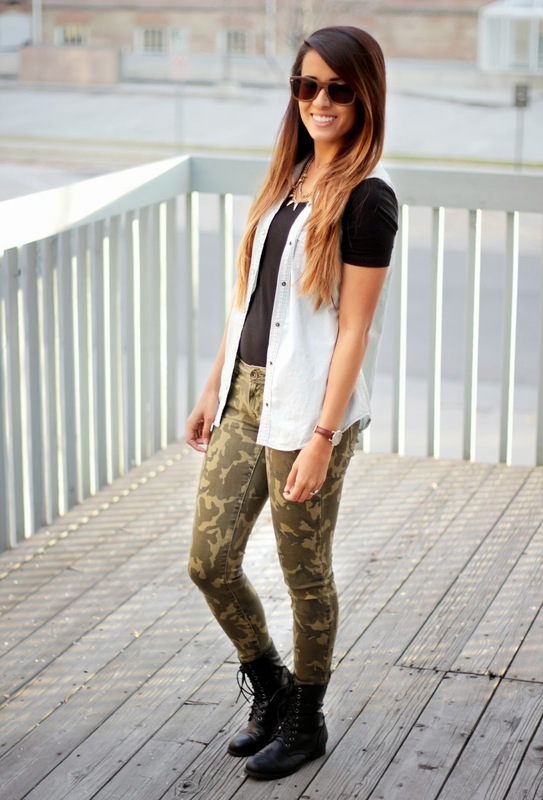 Thanks for sharing your look with Three-fer Thursday! You are so pretty girl! I'm loving those sunglasses too! okay i love the richness of those glasses! so cute thanks for linking up to the all things pretty party! 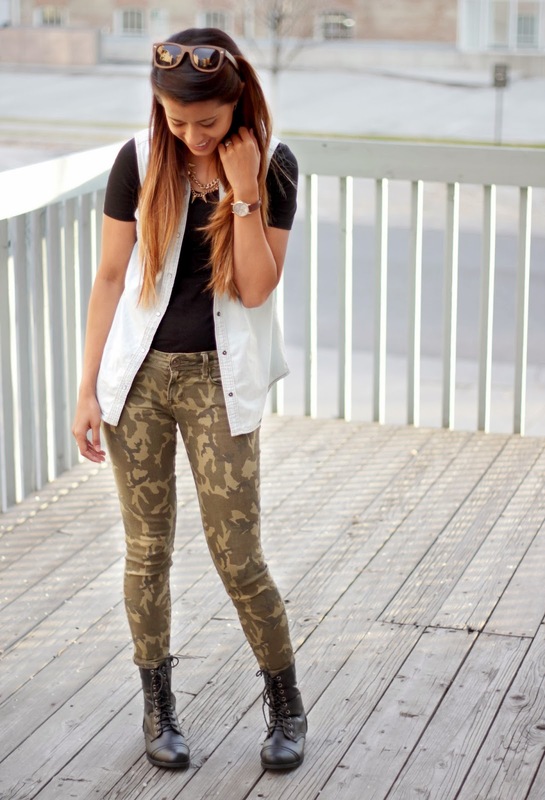 Love your camo pants! Thanks for linking up for Look What I Got. Hope to see you back tomorrow!